The Cabinet Committee on Economic Affairs (CCEA) has increased the minimum support price (MSP) for common grade paddy by Rs 170 per quintal for 2012-13, fixing it at Rs 1,250 per quintal. The MSP for paddy grade A has been fixed at Rs 1,280 per quintal. Apart from the MSP hike, the government has also announced an incentive bonus of Rs 100 per quintal for farmers. The decision was taken in a meeting of CCEA on June 14. According to sources in the agriculture ministry, the hike is attributed to rising cost of fertilisers and pesticides. They said that the Cabinet approved the price suggested by the Commission for Agriculture Costs and Prices (CACP) which recommends MSP to the government. “CACP had suggested a 16 per cent hike in the MSP of paddy which the CCEA has approved,” said an official in the ministry. While the deal for paddy seems to be raw for farmers, the government has once again given a good hike for cotton, a cash crop whose prices dropped drastically in the domestic market from around Rs 6,000 to Rs 3,000 this year. Accepting the CACP advice of steep hike of up to 29 per cent for cotton the government has increased the MSP of cotton (medium staple) from Rs 2,800 per quintal to Rs 3,600 per quintal and cotton (long staple) from Rs 3,300 per quintal to Rs 3,900 per quintal. 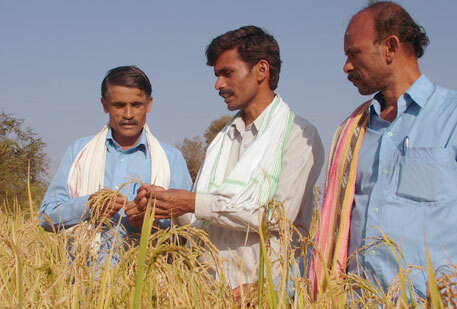 The CCEA increased MSP for urad dal by Rs 1,000 for 2012-13 and fixed it at Rs 4,300. The price for this dal has been raised from Rs 2,520 to Rs 4,300 within just four years. Similarly, MSPs for jowar (hybrid), jowar (maldandi) and ragi have been fixed at Rs 1,500 per quintal, Rs 1,520 per quintal and Rs 1,500 per quintal respectively. The crops have seen hike of Rs 520 and Rs 450 per quintal respectively from the last year prices. Likewise, MSPs of bajra and maize each have been raised by Rs 195 per quintal and fixed at Rs 1,175 per quintal each. The MSPs of groundnut-in-shell, sunflower seed, sesame and niger seeds have been increased by Rs 1,000, Rs 900, Rs 800 and Rs 600 per quintal respectively over the last year’s MSPs and fixed at Rs 3,700, Rs 3,700, Rs 4,200 and Rs 3,500 per quintal respectively. The MSPs of soybean (black) and soybean (yellow) have been increased by Rs 550 per quintal each over the last year’s MSPs and fixed at Rs 2,200, Rs 2,240 per quintal respectively. But the move has not gone well with the farmers. Many farmers’ organisation’s have criticised the Centre for failing to meet the demand of paddy farmers and giving a nominal hike. “Paddy is a food crop that fills stomachs of millions of people and you give a rough deal to such an important crop. Increasing MSP by Rs 50, Rs 100 or Rs 170 is of no use when the fertiliser costs are increasing by Rs 200 every year,” says Dharmendar Singh, general secretary of Bhartiya Kisan Union. He also demanded implementation of recommendation of Commission on Farmers Welfare formed in 2006 and headed by M S Swaminathan that states that MSP should be 50 per cent over the cost of cultivation. Poor farmers were crying, are crying, will be crying, that is the simple economic logic of present Govt. "Oont ke muh mein jeera"- A (small) cumin seed in a camel's mouth - "To small an amount for a very large need." IS GOVERNMENT PURCHASE PADDY IN THIS RATE FROM FARMER OR THIS IS ONLY DECLAIRE.